After ditching the terrible kitchen that I gladly left behind in Mobile (huge room, no counter space, two outlets on walls spaced some 20 feet apart), I enjoyed the large expanse of a kitchen built in the late 90s, complete with tons of cabinet space. Pure suburbia. I didn’t exactly get along with pure suburbia, however, and ended up in a medium-sized condo in Midtown Atlanta with a decidedly NOT medium-sized kitchen. I like it. I donated the china that I’ve been packing around for nearly 20 years (china that was meticulously packed away in my paternal grandmother’s home, so don’t worry that I’ve thrown away some sort of beloved family legacy). I need one more smallish cabinet to keep my own wedding china, which is actually pottery, but other than that a smaller kitchen is definitely working for me. Less to dirty, less to clean up. Less cabinet space to attract stuff that has nothing to do with food prep. 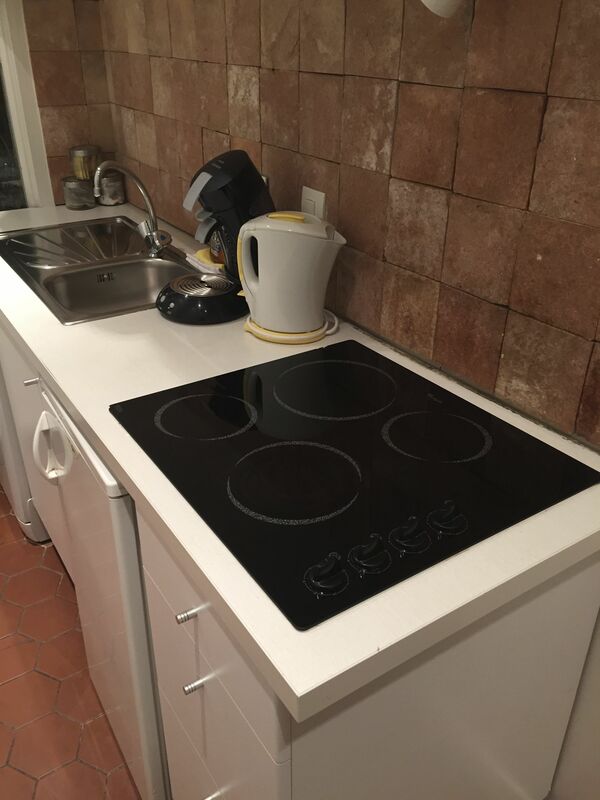 It really took the concept of “no counter space” to a whole new level, but it worked. 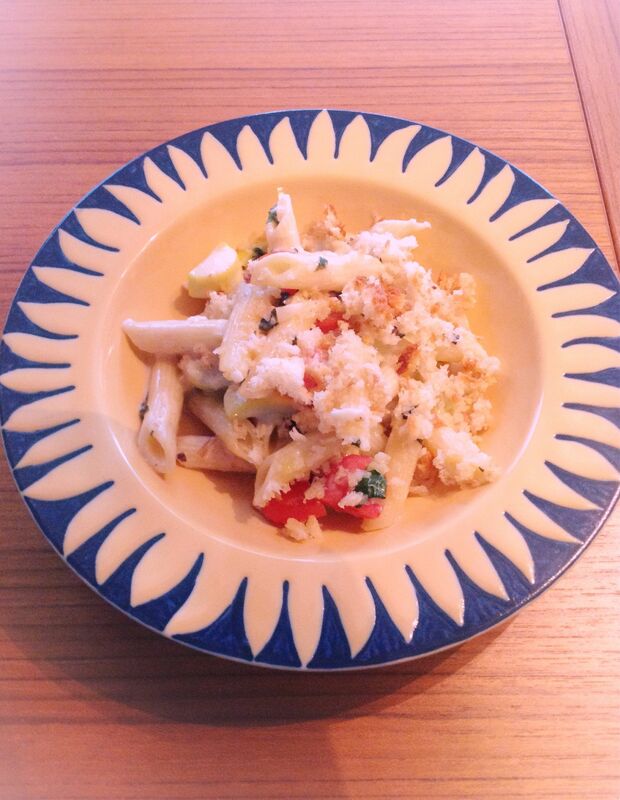 We boiled pasta and heated sauce for Christmas dinner, and we scrambled eggs one morning. 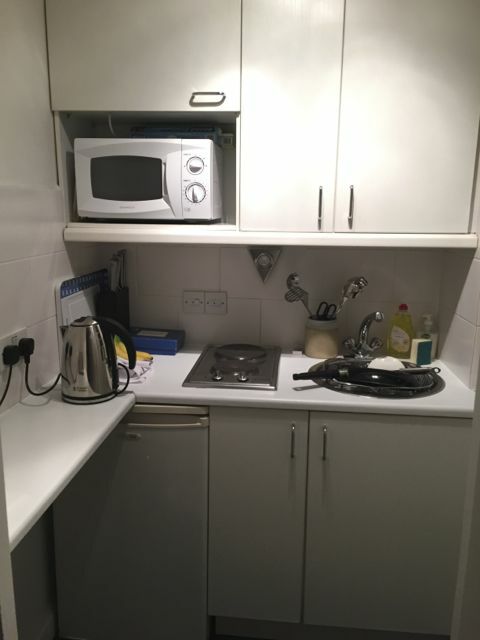 We also had a water kettle, microwave and toaster, meaning we could easily make coffee (via French press) and tea, plus warm up the occasional sandwich or other bakery treat. I think the most complicated thing I made here was oatmeal (dozens of authentic French bakeries within walking distance does not prompt a girl to break out the pots and pans). I also enjoyed the kitchen’s Nespresso Senseo coffeemaker, which I was disappointed to learn is no longer sold in the United States. While I hold anything involving K-cups in utter disdain, I could live with coffee made from those little filter packets every last day. So much more to talk about from this trip later. Right now, I have to go enjoy the wide-open spaces of my tiny condo kitchen. After four summers of putting up with the squash in my CSA box, I have, at last, found a reason to love the stuff. My habit of perusing stacks of used books finally paid off during a spring visit to Nashville’s BookManBookWoman, which yielded a copy of Cover & Bake by the Cook’s Illustrated team. I’ve found the Cook’s Illustrated collections to be virtually foolproof — they do, after all, painstakingly test each recipe numerous times before releasing it into the wild. I grew up with very little respect for the squash. I remember eating it mostly fried, although surely that wasn’t the only way my mother and grandmother prepared it. The only thing I really figured out to do with it myself was to chop it up and sauté it with a little garlic and olive oil. Passable, but by no means a method to use up copious amounts of squash. This recipe, however, uses 2 entire POUNDS of squash, meaning I haven’t spent the last two weeks feeling bad about unwanted veggies languishing in the crisper. They’re all gone. The original recipe specifically calls for zucchini and summer squash. I was saving my zucchini for brownies (I’ll share that recipe soon — seriously the best brownies ever), and I had at least three other varieties of squash in the box, including Slick Pik, Zephyr and patty pan. Squash is squash, I say. I also substituted chopped leeks for the shallots, since I had leftover leeks and the Internet vaguely signaled that they would be OK. No complaints. I also never bother keeping parsley in the house, so I used an entire cup of chopped basil instead of buying a whole bunch of parsley just for 1/4 cup. This recipe is a lot of work, to be sure, but totally worth it. The creamy sauce delivers a consistent hint of fresh basil, and every forkful delivers a healthy array of veggies. Process the bread and butter in a food processor fitted with the steel blade until coarsely ground, about six 1-second pulses; set aside. 1. Toss the squash with 1 tbsp. kosher salt and place in a large colander set inside a large bowl to drain, about 30 minutes. 2. Bring 4 quarts of water to boil in a Dutch oven over high heat. Stir in 2 tbsp. kosher salt and the pasta; cook, stirring occasionally until al dente. Drain the pasta, return to the pot, and toss with 1 tbsp. of olive oil; set aside. Adjust oven rack to the middle position and heat to 400 degrees. 3. Spread the salted squash evenly over a double layer of paper towels and pat dry with additional paper towels, wiping off any residual salt. Heat 1 tbsp. olive oil in a 12-inch nonstick skillet over high heat until smoking. Add half of the squash and cook, stirring occasionally, until golden brown and slightly charred, 5 to 7 minutes. Transfer to a baking sheet. Add 1 tbsp. olive oil to the pan and return to high heat until smoking; brown the remaining squash and transfer to the baking sheet. 4. Wipe the skillet clean with a wad of paper towels. Add the remaining tablespoon of olive oil and return to medium-high heat until shimmering. Add the shallots and cook until softened, about 3 minutes. Add the garlic and cook until fragrant, about 30 seconds. Add the flour and cook, stirring constantly, until golden, about 1 minute. Off the heat, stir in the Parmesan, basil and parsley. Season to taste with salt and pepper. 5. Add the sauce, tomatoes and sautéed squash to the pasta; stir gently to combine. Pour the pasta into a 9-by-13-inch baking dish and sprinkle with the breadcrumb topping. Bake until the casserole is bubbling and the crumbs are lightly browned, about 15 minutes. Serve immediately. 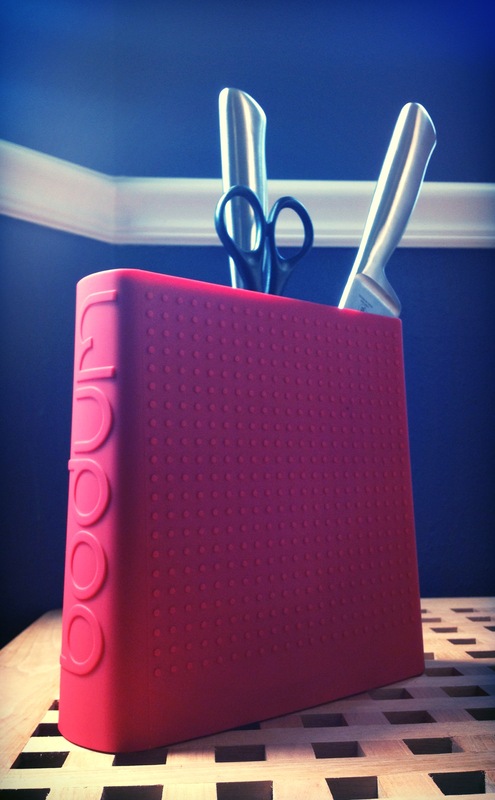 The Bodum Bistro Universal Knife Block: definitely on my list of Favorite Things right now. The new cookware we bought a couple of years ago came with a set of really groovy, really sharp knives. I began using them in place of the set of less exciting knives that have been getting duller by the minute in their wooden block ever since someone gave them to us nearly two decades ago. Where do you keep loose knives, especially when you want them to keep their edge? I was reduced to keeping these in the silverware drawer and trying to keep them from butting into each other. I really like the look of a magnetic knife rack, but I don’t trust Yang, despite his advanced age, not to go smacking shiny knives off the wall in the middle of the night. Amazon.com to the rescue. I found the Bodum Bistro Universal Knife Block during my search for a solution. It’s STUNNING, and it takes up next to NO room on the countertop. I love the bold color (it was, at some point, also available in black, orange and lime green), and the functionality can’t be beat. It contains hundreds of narrow plastic sticks, which allow the knives (and scissors) to easily slide into place. My largest knife is too tall to drop in vertically, but it goes in quite neatly at a slight angle. A view from the top: Although it currently houses only three knives and a pair of scissors, the Bodum knife block has plenty of room for more occupants. At nearly $50, it was a bit of an indulgence, but what’s better than an indulgence that actually solves a problem? So it turns out that strawberry shortcake is NOT simply strawberries with pound cake, angel food cake or sponge cake (no, not even those perfectly round little sponge cakes sold in packs of six in your grocery store’s produce section). The shortcake you likely remember from your childhood? An imposter. Shortcakes are essentially biscuits made with butter instead of shortening, with just a hint of added sugar. They’re supposed to accent the strawberries, after all, not compete for the title of sweetest dessert element. 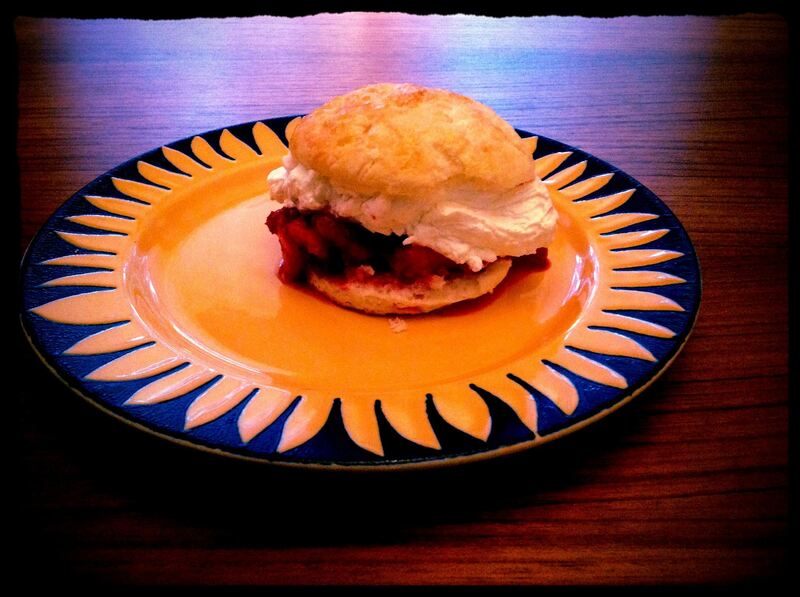 I’ve made the Cook’s Illustrated version of strawberry shortcake a couple of times, and it’s a winner. The shortcakes are light, but substantial enough to hold the juicy berries without falling apart. The strawberries themselves could probably do with a little less added sugar, especially if you’re lucky enough to get specimens as sweet as I’ve found at the Dennison’s Family Farm strawberry stand this year. The recipe makes way more shortcakes than two people need, but the leftover cakes are good for a couple more days and you can make half, a third or even a quarter of the whipped cream recipe if you like. Adjust an oven rack to the lower-middle position and heat the oven to 425 degrees. In a food processor, pulse the flour, 3 Tbsp. of the sugar, the baking powder, and salt to combine. Scatter the butter pieces on top and process until the mixture resembles coarse meal, about fifteen 1-second pulses. Transfer to a medium bowl. Use your fingertips to pat the dough into a 9-by-6-inch rectangle about ¾-inch thick, being careful not to overwork the dough. Bake until the shortcakes are golden brown, 12-14 minutes. Place the baking sheet on a wire rack and cool the cakes until warm, about 10 minutes. When the shortcakes have cooled slightly, split them in half. Place each cake bottom on an individual serving plate, and spoon a portion of the fruit and a dollop of whipped cream over each cake bottom. Cap with the cake top and serve immediately. A few years ago, I discovered that cooking is a lot like painting: The more work you put into a project before you start, the smoother everything goes once you begin. I had always noticed that people on cooking shows had premeasured ingredients at the ready, but I figured they needed to do that so the camera didn’t have to follow the mundaneness of the measuring process. At some point, however, I realized that premeasured additions made a lot of sense. What’s easier: Scooping out various amounts of spices while standing at the stove at the very moment those ingredients need to be added to your concoction, repeatedly glancing back at the recipe, or measuring out all of those ingredients before you start so you can dump them in at the appropriate time, all at once and with no double-checking of the recipe? A lot of the recipes I frequently use call for tiny amounts of ingredients, meaning it was hard to justify dirtying even my smallest bowls for premeasuring. I had been using wax paper for these smaller measurements, but tearing tiny squares off the roll made for an untidy rectangle when I would finally need a larger piece. IKEA to the rescue. During my going-away trip to the Atlanta megastore, I stumbled across the BLANDA bowls. At $2.99 for a pack of four, these 2-inch bowls are the perfect size for my small additions of herbs and spices. One bowl will hold approximately four minced garlic cloves (provided, of course, that you haven’t been tricked into buying some monstrous head of garlic with supersized cloves) and maybe 4 teaspoons of herbs and spices. I almost bought the stainless steel version ($4.99 for four), but I could tell that they were going to scratch easily, since every package I picked up sported at least one bowl that was already pretty roughed up. So far, the most bowls I’ve used at one time is three. 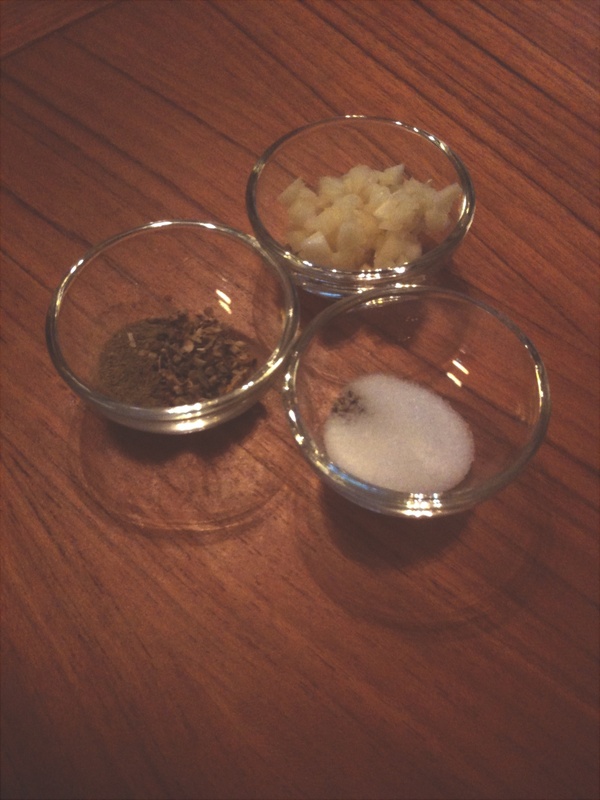 I took the photo above during Cinco de Mayo’s fajita-making festivities; one holds minced garlic, another holds oregano and thyme, and the third holds salt and pepper. All in all, probably not that much to measure out midway through the cooking process, but dumping a tiny bowl of premeasured ingredients into a pan filled with sizzling onions makes me feel like I should have my own cooking show. Iron Chef Haggerty. I like it. 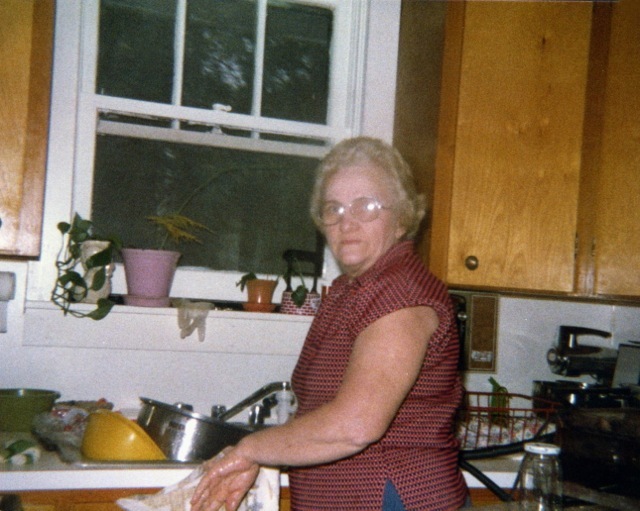 Nanny in her natural habitat: the kitchen. I realized this weekend that I have successfully made a souffle, but can’t make a fried egg. My grandmother made delectable fried eggs, and made it look easy. The everyday breakfast options at her house included bacon (turkey bacon after my grandfather’s heart problems were diagnosed), toast (or biscuits, on occasion) and eggs, either scrambled or fried (note: fried eggs, over easy, became known as Paw-Paw eggs, because they were his favorite, and to this day I can barely order them in a restaurant without calling them by this nickname). I might not even have this ongoing fear of cast-iron skillets. I’ve spent the last five years trying to figure out how the heck side-by-side refrigerators got so popular in the ’80s. I grew up thinking my family, with our old-fashioned one-door, freezer-on-top model, was missing out, that somehow the families with side-by-sides were enjoying better meals and tastier snacks. They were certainly enjoying hipper, more modern kitchens. Oh, the misguided assumptions of youth. 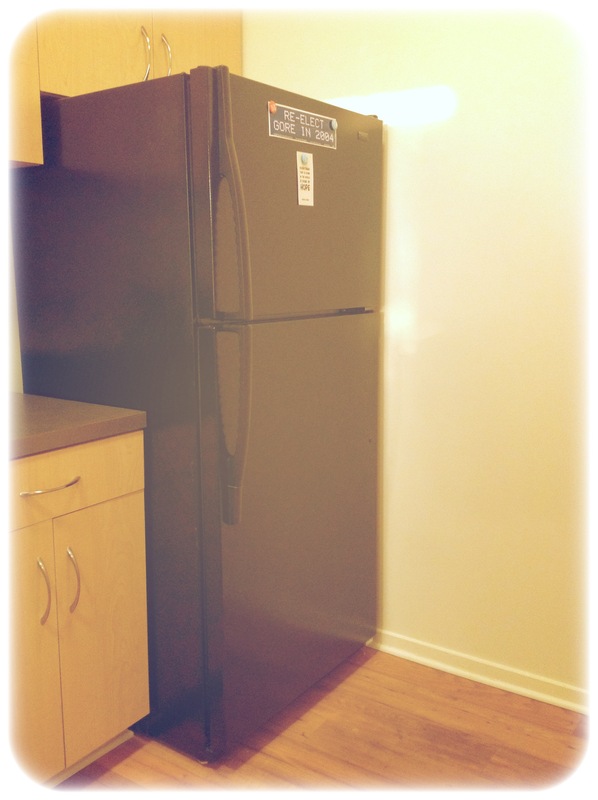 I finally got my new-fangled side-by-side refrigerator when we moved to Huntsville (at the same time, I might add, that the hippest homeowners were purchasing refrigerators with French doors and freezer drawers on the bottom). I quickly ascertained that side-by-sides are virtually useless for anyone who actually wants to USE a refrigerator. I was constantly rearranging things to try to make other things fit. The freezer was a disaster, with two extremely deep, extremely narrow drawers that quickly turned into a tumbled mess of freezer bags and containers no matter how careful I was to try to keep them organized, and shelves that were difficult to navigate despite their small size. Organizing the refrigerator shelves was like playing a game of culinary Tetris. A gallon of milk and a container of orange juice was pretty much all the top shelf could handle. My love for greens fresh out of the salad spinner required a dedicated bottom shelf. The small salad spinner, mostly reserved for fresh herbs, sometimes had to reside in the crisper, a problem given that the drawer usually already contained an array of veggies. We never got around to getting another one, partly because someone had kindly custom-built the cabinets around the refrigerator, severely limiting the potential replacement models. Now that I’m in Atlanta, I’m once again living with an old-school, freezer-on top refrigerator with one non-French door. Only this time, I’ve decided that old-school is pretty awesome. The refrigerator shelves offer wide, open spaces — currently, the salad spinner is residing alongside half a gallon of milk, a carton of goat cheese AND a jar of jelly. The freezer’s a huge open space — no shelves, but a couple of small plastic boxes can help sort a LOT of frozen foods. It even has a working ice maker, an innovation that I have, until now, not enjoyed in my own home. The whole setup is so much more usable than the side-by-side that I’m not even curious about freezer drawers on the bottom anymore. I just want space that makes sense. I guess the moral of this post is to be careful what you wish for, because you might be stuck cursing at it for five long years when you finally get it.